For those of you unfamiliar with “Minecraft” and by that read well past their teenage years, Minecraft is a computer game in which you design your own houses and land whilst being attacked by “creepers”. Yes, I know, it sounds riveting doesn’t it? As I said I think you have to be under the legal drinking age to appreciate it. Maybe it is all to do with how the immature brain perceives things. Let me explain what I mean. I am of the generation that saw the rise of computer age from the cassette driven Atari games through Sonic and the early PlayStation resulting in todays amazing graphics on the X-box and Playstation 3 and the instant accessibility of the internet. So forgive me for being unable to fathom the appeal of a game with graphics that look like boxes. Imagine my joy then when I discovered that I wasn’t the only mother who failed to understand her son’s Minecraft obsession. 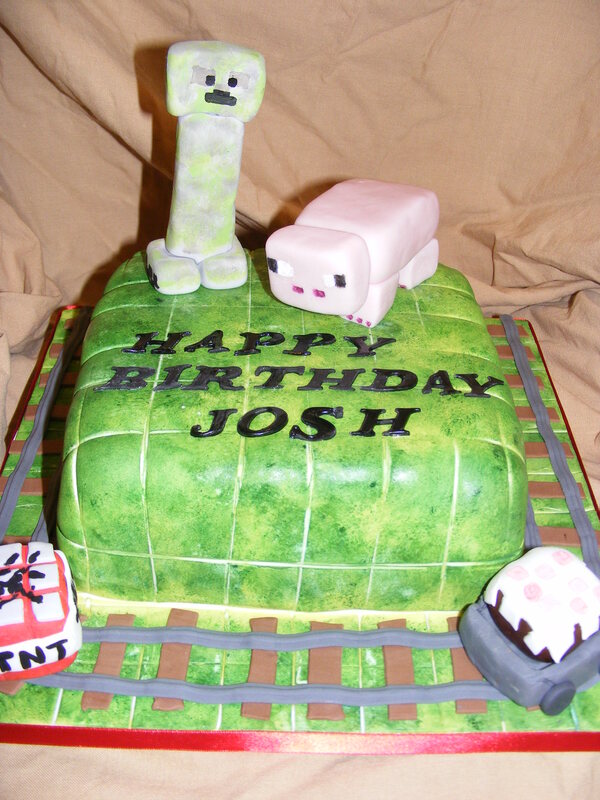 That joy turned to despair, however, when Rachel asked me to make her son a Minecraft Birthday cake. I might add at this point that Rachel is my vet and since she had a thermometer inserted into my poorly whippet’s bottom when she asked I thought it would be a tad unfair to Hector to say “No”. Roll out approximately 10oz white sugarpaste and use this to cover the cake drum. Trim the edges with a sharp knife. Then smooth the board. Use the edge of a ruler to mark a grid into the soft sugarpaste. Allow the board to dry out, ideally overnight. Cover the cake with a layer of buttercream ensuring you cover the sides completely. Put the cake in the fridge to 5-10 minutes to allow the buttercream to firm up a bit. Knead 2lb of sugarpaste until soft, smooth and pliable. Roll the paste out and use to cover the cake. Trim any excess sugarpaste using a pizza cutter as this gives a clean straight edge, tight to the cake and will not tear the icing. Place the cake onto the prepared board then using the grid on the board as a guide, continue to mark the cake using the edge of a ruler. Dissolve a little citrus green dusting powder in dipping solution or vodka. 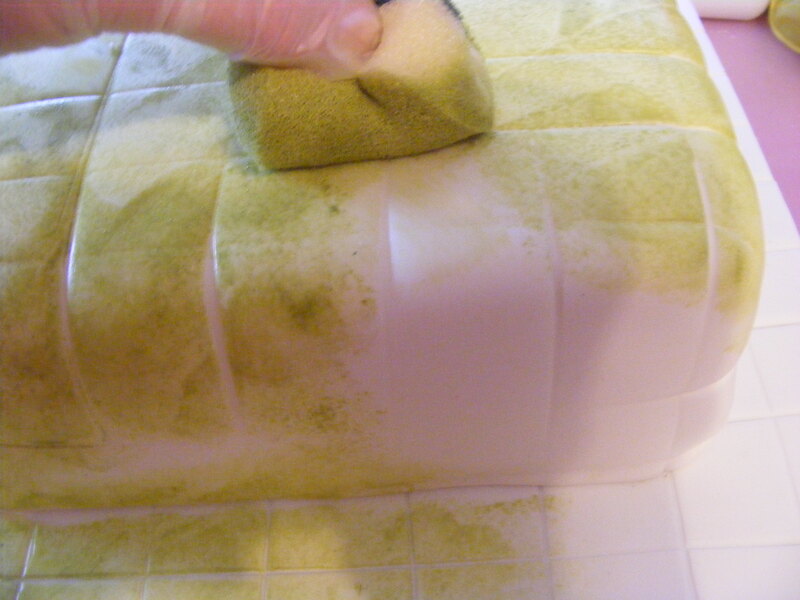 (Never be tempted to use water as this will make the sugarpaste become very sticky and difficult to work with) Sponge a base coat of the citrus green all over the cake. Repeat this process with darker shades of green. I used apple green then a light to coat of forest green. If some of the grid lines are lost, simply use the edge of the ruler to redefine them. Set aside and allow to dry. Whilst the cake is drying you can make the figures and decorations. Firstly knead into some sugarpaste a little CMC or gum tragacanth to create a modelling paste. I coloured some of the paste pink and used this to create a pig. This is simply four cubes for the feet, a larger block for the body and a medium-sized block for the head. It was held together using dried spaghetti and edible glue. You may need to prop something under the head until the glue sets. I added character to the pig by painting on toe nails, a tail and a very simplistic face. The creeper was made from two blocks of paste for the feet, a long flattened block for the body and a large block for the head. 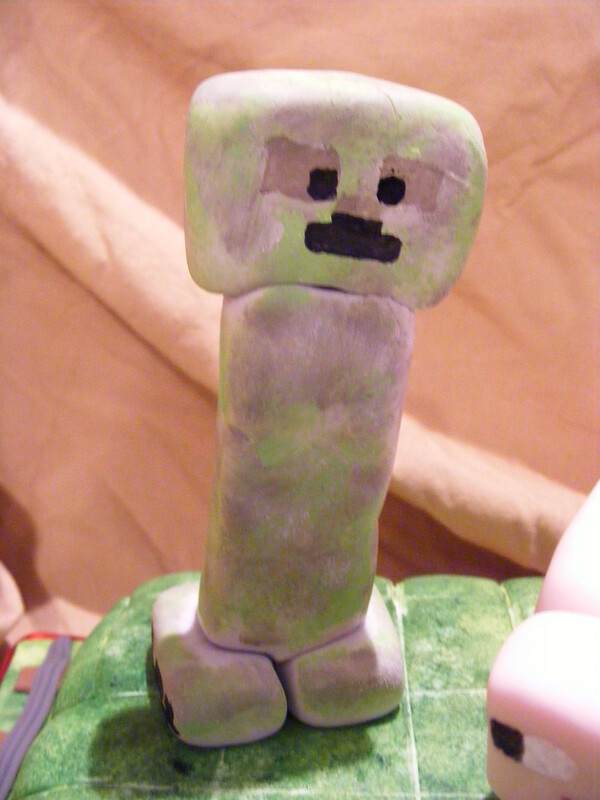 I found it necessary to insert a dowel into the body of the creeper to prevent it from leaning or collapsing. To colour the creeper I coloured the sugarpaste pale grey before modelling it then sponged the whole model with a spring green colour and then a light beige. Painting the face and feet completed it. 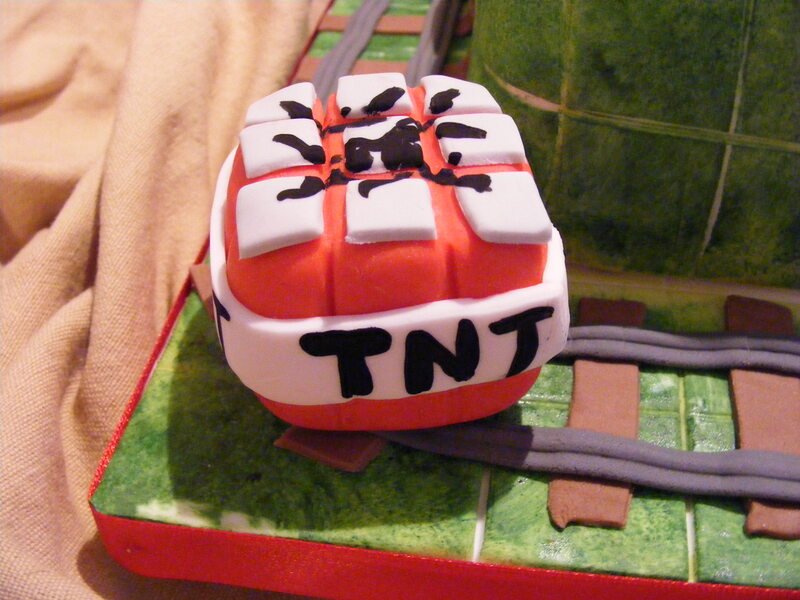 Red sugarpaste was used to make the TNT block. I marked 9 sticks using a ruler, added small grey square to represent the top of each stick then wrapped a strip of white paste around the block. Painting TNT in black completed it. 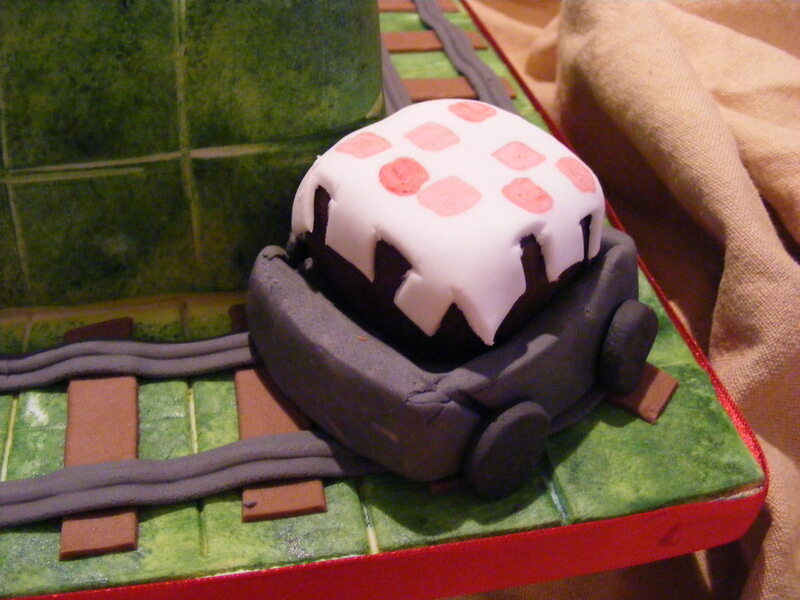 The railcar carrying the birthday cake was simply a small block of grey paste with black circles added for wheels. The cake was a block a brown paste with a thin layer of white paste on top with a shaped edge. I then finished it off with hand painted pink squares on the top. I added a simple track to the edge of the board and the Happy Birthday, Josh to the top of the cake. Adding a red ribbon to the edge of the cake drum completed the cake. My son assures me that any fan of Minecraft will “get it”. This game has so many items in it that I was spoilt for choice as to what to include on the cake. This is my first attempt at a Minecraft cake and I’m sure if I do another one that I might alter how I do it and what I include but for a first attempt it is not too bad. Let me know how you get on if you have a go at making it. Previous PostGood Old Fashioned SconesNext PostChai Tea Sponge Cake with Vanilla Buttercream. Ahhhh Ali, you and I are on the same basic page – and I have a May b’day Minecraft request. I grew up playing the old Star Trek games on IBM mainframes before “Pong” came out on Atari… So… Yea… I’m an old mom, should be my grandkid’s Minecraft cake to worry about, but oh well!! I’m in the car now but looking forward to studying the instructions later!